Update 2017: It is with a heavy heart that we announce that Sarjai's has closed. The good news? Chef Darren Connor will be re-opening in another location soon. Stay tuned for details! By the time I dined at Sarjai's (roughly six months after its opening), it already had a strong following with only excellent reviews behind it. Now that's what I call a good start! 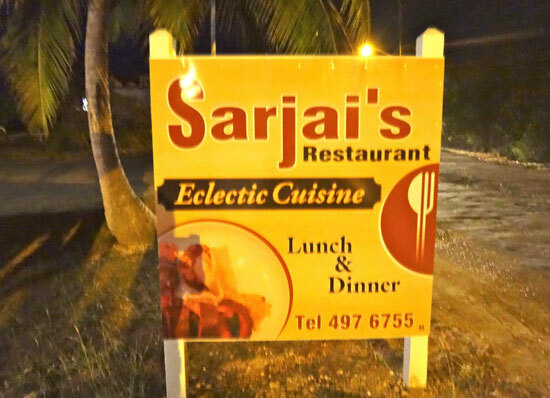 I was curious about Sarjai's having read that its owner and chef was the award winning Darren Conner who is famous Caribbean-wide for "bringing home the gold" to Anguilla from the biggest culinary competitions in the region. I have also noticed a pattern with my own taste in Anguilla dining. I tend to favor the restaurants that are owned and operated by local chefs whose establishments are mostly inland. On an island whose main industry is tourism, most visitors flock to the seaside restaurants to either hear and/or see the ocean while taking in a meal. It is a special perk of dinner. I like the water nearby too. However, I've found that when the menu I'm reading and the food I'm eating is remarkable enough, I forget the surroundings. This may be why I love Anguilla restaurants like Tasty's, Veya and E's Oven. It's located in a quiet neighborhood in the western end of Anguilla in the village of Long Bay (just before you reach Malliouhana). Many may recall Lucy's Restaurant in Long Bay - a long, running restaurant known for its home cooking. Sarjai's Restaurant opened in the former Lucy's. 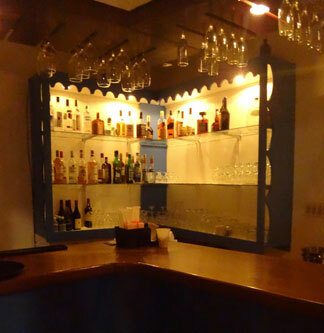 Sarjai's is in a clean and brightly painted building with Caribbean charm, an interior dining room and covered porch. There's a small bar and at night time, it's soothingly lit. Parking is on site and easy. I loved the lighting in the dining room… It was low light, without being too dim. The crisp white linens and shining glasses and cutlery all contributed to an elegant yet comfortable setting. We chose, though, to dine on the casual porch area to take in a little breeze. 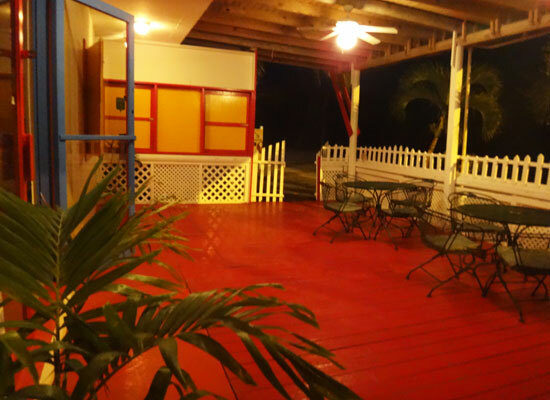 The porch light shone bright, amplifying the restaurant's red, yellow and white paint. I faced the street, looking at the trees and taking in the neighborhood atmosphere. It's not a busy street at night, but there is something special to the peaceful ambiance. Settled into our table on the porch, it was time to order. Having investigated the menu before arrival, I had a feeling I would like anything I chose. 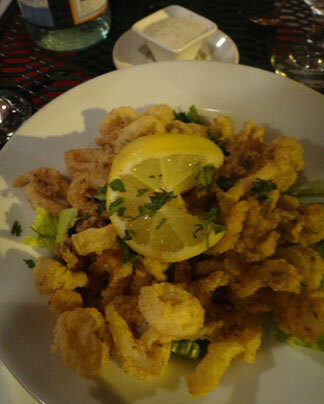 For example, I noticed the calamari was served with lemon aioli as opposed to marinara, my preference. The accompaniments to appetizers, entrees, and desserts seemed spot on and not overzealous. Ingredients such as ginger, leeks, roasted garlic, curry and pineapple are on the menu. The menu itself, every section of it from lunch to dinner, has a well-varied amount of dishes making it nicely balanced. The descriptions make "decision time" tough. I wanted to try the Tuna Tartare Crisp, described as tuna shreds layered with fresh herbs, jalapeños and lemon with drizzles of soy sauce and olive oil. There were plenty of tempting choices and I had come with a few friends so I went with the crispy calamari for easier sharing. I was glad that I did because the calamari was terrific. Perfect, light and crispy and prepared properly - not chewy and not too greasy. The lemon aioli added a zesty touch, complementing the calamari. The price was right at $12 US. Some other options included a caprese salad, goat cheese salad and fish taco. The soup of the day was ginger carrot. My friend ordered the ginger carrot and thought it seemed more like plain carrot soup. Others in our dining group, though, could detect the hint of ginger. I liked it and would order it for myself on a future visit. It was also a good portion and for $7 US. Then on to entree selection - an even tougher decision. If I didn't eat so much chicken at home, the Jamaican Jerked Chicken with cinnamon-fried plantain and thyme might have made the cut. ... or the Snapper Creole with curried cabbage and Grandma Mary's potato dumpling... or the Coconut Crusted Shrimp with whipped potatoes and pineapple sauce. ... or the dish that pays homage to Island Harbour, the Grilled Lobster or Crayfish in Garlic Caper Butter Sauce. Its price was listed at $37 US and that made me do a double take. 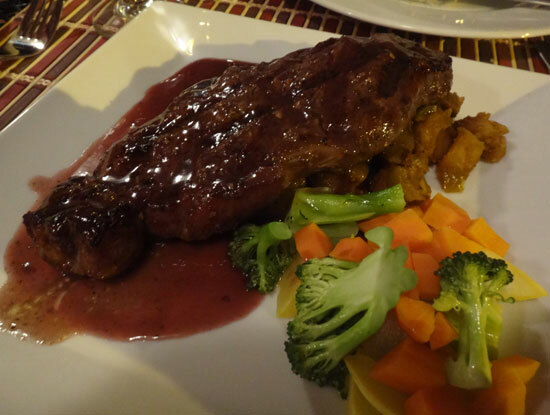 In many of Anguilla's upscale restaurants you will see that same entree for $45 US and up. The pricing was fair and it's always a reward to feel as though you got a deal, right? The fantastic calamari was $12 with the appetizers ranging from $7 and up to $15. The entrees range from $20 to $37. I went with my first thought - the 10 oz. NY Steak Au Poivre with Aunty Joan's homemade curried fries. Chef Darren has won awards for his beef dishes, including this one. I ordered the steak medium and it was served medium, alongside the steamed vegetables, over-top of the fries. The sauce had a savory flavor and the curried fries?... I have not stopped thinking about those. The potatoes were cut in to cubes and, though, not necessarily eye-pleasing, the texture and flavors were extraordinary. I ate all of my steak and was feeling full after having some calamari and a couple of selections from the bread basket that was served before dinner... which, by the way, had a variety of rolls and mini johnnycakes and came with a special butter that everyone at the table ooh'd and ahh'd over. On to the next special treat from Sarjai's - dessert. While I don't have a big sweet tooth, again, something was telling me I would not be disappointed with my order. 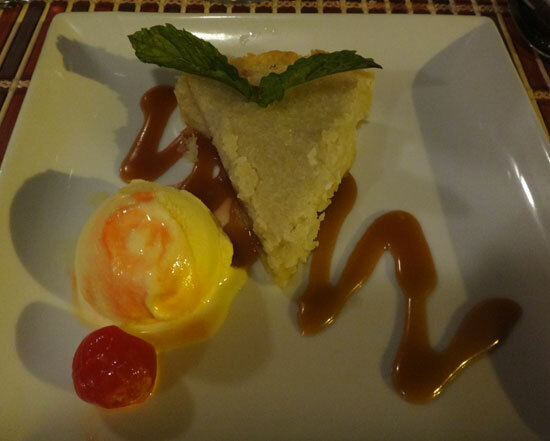 I went for the Warm Coconut Pie with vanilla ice cream and ginger caramel sauce. Would Sarjai's Caribbean Rum cake or the Passion Fruit Cheesecake with Strawberry coulis be stand outs like the Coconut Pie? I will have to find out next time but it would be difficult to not choose the Warm Coconut Pie again. They also have an assortment of homemade ice creams. All desserts are $8. The service at Sarjai's was well-timed and we were never kept waiting too long. In fact we unintentionally took our time and kept the gracious staff waiting. They were understanding, patient and courteous. Feta Cheese Salad, Stir Fried Vegetable with Angel Hair Pasta, Chicken Quesadillas, Mahi Mahi Sandwich, Double Cheeseburger and Shrimp Fettucini are lunch menu items which runs from $7 to $22. I spoke with Chef Darren after dinner, congratulated, thanked and wished him well. On an island known for its fabulous dining and with so many restaurants you always hope each one makes it - especially for those who create their businesses out of pure passion and talent as is the case with Darren. He named the restaurant after his daughter. His wife is hands-on in managing it as well. A true family affair! He's carried with him all of his training and chef experiences for the last 20 years, from restaurants abroad, to Anguilla's own Viceroy. The goal has always been to have an outstanding restaurant of his own. And now he's achieved exactly that. For me, it was a happy new find in Anguilla. Chef Darren has a great menu, fair prices and a nice staff. His food will stay in your memory and it's no wonder with such a strong reputation. The evening I met Darren he had just returned from a trip to Omaha, Nebraska where he was continuing his education on beef. How's that for being detail oriented? Chef Darren cares about his craft and he excels at it. That says it all! This little gem was one of our favorite meals on Anguilla. We were staying at the Malliouhana and it was a short walk from the resort. We started with Tuna Tartare and crispy calamari. The appetizers were wonderful. The Tuna was the best we had this visit. For Entrees we had the Curry Shrimp and Snapper Creole. Both dishes were incredible. Fresh and flavorful. Dessert was the best coconut pie I have ever tasted. My advice is to seek out this little gem of a place for a delightful, friendly dinner. The entire meal we were wondering why this place was not packed. It may not be waterside, but the food is worth the trip. Directions: Set just beyond Malliouhana (if you're heading away from the beach) on the left side of the road. Hours: Daily for lunch and dinner. Closed Mondays.